Born 1935 in Barcelona, Spain. Lives and works in Paris, France. Since the mid-1960s Joan Rabascall has worked on unveiling the mechanisms behind image-making, and in particular the mass media’s manipulation of representation. After he was exiled to Paris from Francoist Spain in 1962, Rabascall met avant-garde artists of the Independent Group in London, the nouveau réalistes in Paris, theorist Lawrence Alloway and critic Pierre Restany who exhibited his works in 1966. With other Catalan artists – Jaume Xifra, Antoni Miralda and his wife Dorothée Selz – he organised a series of collective dinner performances in 1969 and 1970. His collage technique interrogates the very essence of image construction, offering a re-reading of existing images, subverting their original content and context. By reframing and associating contrasted images taken from everyday life, Rabascall turned the communication tools of mass media against themselves. Joan Rabascall started using the technique of photomontage and photographic emulsion on canvas at the end of the 1960s, working with cut-outs from magazines, newspapers and advertising posters. 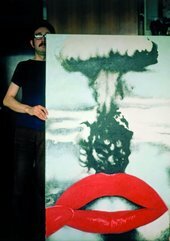 Atomic Kiss 1968 is emblematic of Rabascall’s interest in reactivating the meaning of an image by means of associations with conflicted images. Responding to the bombardment of images by the mass media, Atomic Kiss superimposes an iconic, sensual and Hollywood-inspired red lipsticked female mouth with an image of an atomic explosion. An ironic and violent portrayal of the socio-political context of the upheavals in the late 1960s, this work depicts the ambiguities of American consumerist society, which hid behind its glamorous cinema icons a mass destructive military power. Interview with the artist Joan Rabascall, included in the World Goes Pop exhibition at Tate Modern.